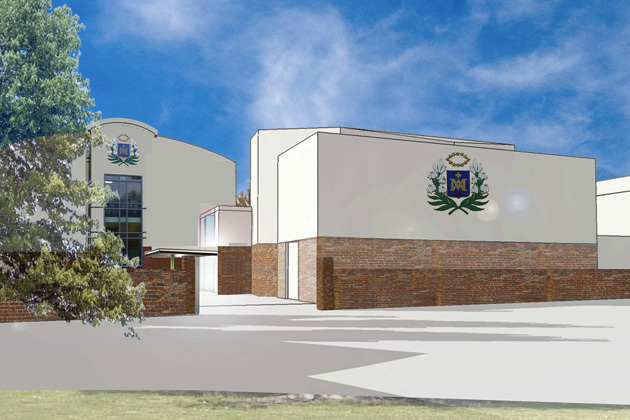 Tuke Manton architects have been commissioned by Notre Dame School to develop a new performing arts centre. The site is located at Burwood House, Convent Lane, Cobham, Surrey KT11 1HA. The School has a 400 year old tradition and expertise in educating girls, and has been established in Cobham for 70 years. The School educates 760 children from primary school to Senior School. A detailed description and more information about the school can be found on their website at www.notredame.co.uk. 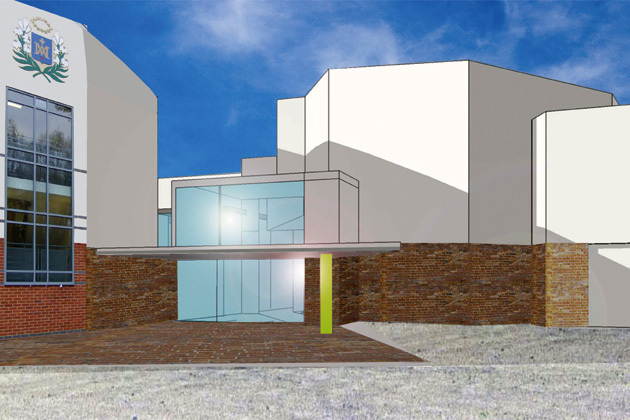 The brief is to design a 370 seat theatre and new drama studio with support spaces. 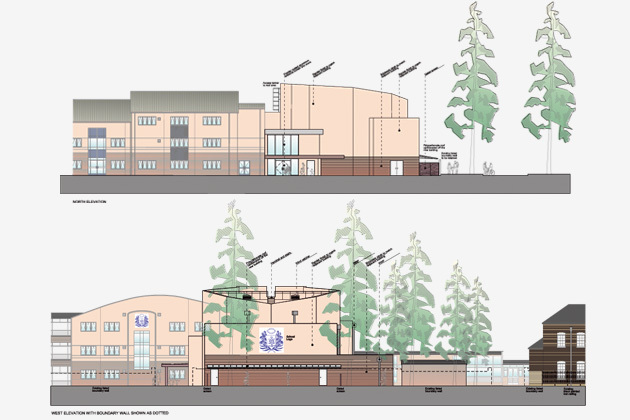 The proposal is to demolish the existing hall and garage to allow the new building to be linked into the existing dining area. At an early stage in the design process it was recognised that the budget would not allow all of the school’s requirements to be realised, therefore we have designed the building with as much flexibility as possible. 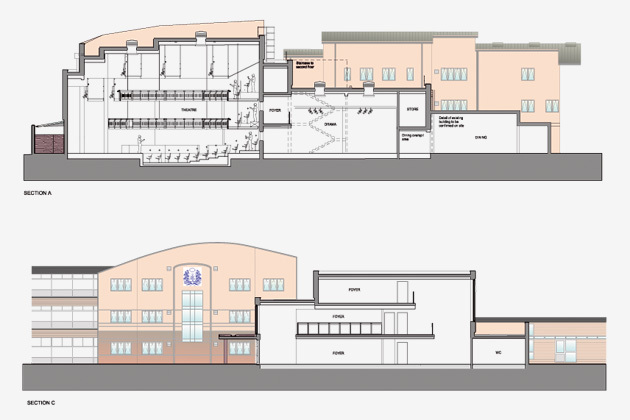 The new drama studio will open up to the new foyer so that it can be used as one large space during performances. The foyer links into the dining room so that catering can be provided as required. 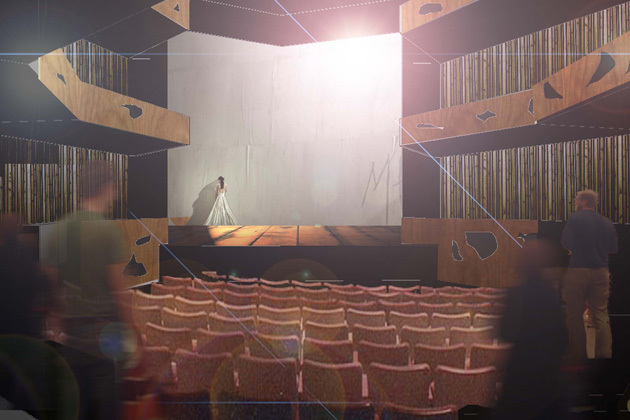 The design team includes a specialist theatre consultant and it became clear that the traditional proscenium arch design coupled with the support spaces required was difficult to fit on the proposed site. A theatre in the round takes up less space as well as providing the intimacy of performance which is not achievable in a traditional theatre design. The entrance is set in the preferred location and provides the foyer linked with the drama studio and dining room beyond. 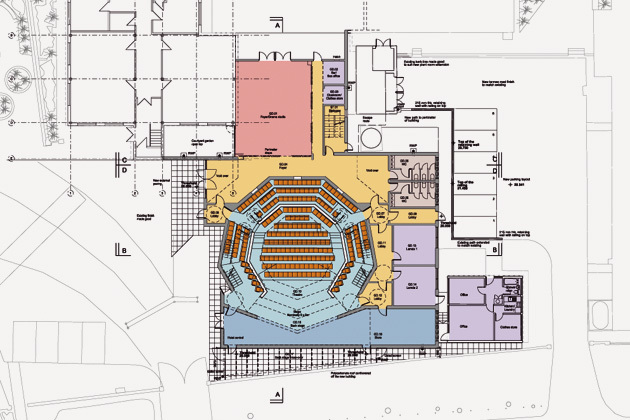 The creation of a new theatre is the key behind the proposals and the theatre consultant has recommended a minimum stage size of 9 x 9m with a minimum stage height of 5.4m for a school of this size. The technical galleries above require a 2.4m working height to ensure safe operation of equipment with space above for the structure and services. The drama studio has been recommended as being 9 x 9m with a minimum 2m working space around the edge for rehearsals. Site constraints have dictated that this space is smaller than required but the School have agreed to the reduced working area in the interests of keeping the built envelop to a minimum. The new building mirrors the listed building by sitting proud on the site boundary. A human scale to the perimeter is created with low level accommodation set at ground level. The foyer incorporates as much glass as possible to allow views through the building. Activity in the foyer and drama space will be visible by passing pedestrians. A planning application has been submitted to Elmbridge Borough Council.